Our next mini-tournament is a little different in that it features a rather obscure Junior A league — the Alberta Junior Hockey League. While it may not be obscure to scouts or Albertans, it is to the rest of the world, obviously. My goal in launching this tournament is to take advantage of the AJHL's obscurity. One of the drawbacks to our previous tournaments is that voters were already very familiar with every logo going in. Most already had their minds made up before they even looked at the polls. The AJHLToL removes that element. Voters get to look at these logos with fresh eyes and, unless you're from Alberta, you have no emotional attachment to any of the teams that might skew your selection. Instead, we get a tournament that cuts right down to the basics: Which logo is better? The AJHL has 16 teams spread across two divisions — North and South — in the province of Alberta. Because this is technically a mini-tournament, there will be three weeks of round-robin voting. Each logo will face three others from within its own division, determined at random. The full format is explained below. Notes: Standings updated every Monday after all polls close. Tables are sortable by header. Top 4 from each group advance to playoffs. 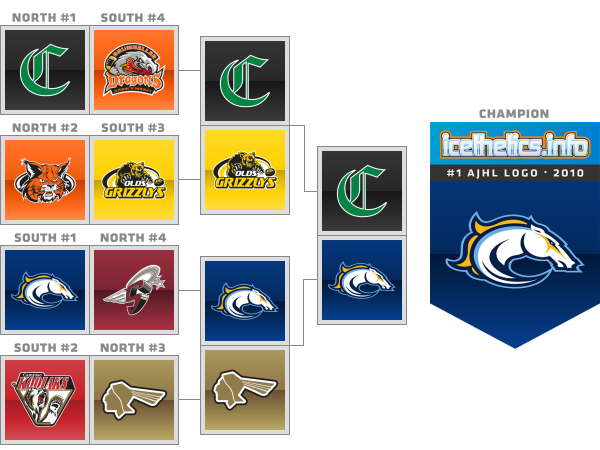 Eligible Logos 16; The primary logos set for use by the AJHL's 16 teams in the 2010-11 season will be used in this tournament. Preliminary Round The preliminary round, in a round-robin format, will last three weeks with each logo facing three others from its own division. Opponents are randomly determined. As with all logo tournaments, logos accumulate points in the standings with percentage points in the polls. A logo that collects 62% of the vote in a poll earns 62 points in the standings that week. Quarterfinals As with all of our tournaments, the Top 4 logos from each group will advance to the first round of playoffs. Group A's #1 seed will play Group B's #4 seed, Group A #2 faces Group B #3 and so on. The logo with more votes in each poll wins and advances to the next round. Semifinals The winners of the Quarterfinal polls advance to the Semifinals. The logos with more votes in their respective polls win and advance. Championship Final The winners of the Semifinal polls advance to the Championship Final. The logo with more votes at the end of the poll wins the tournament and universal bragging rights.